Editor’s Note: It is the QCP policy to post all op-eds. They do not reflect the views of QCP or its writers. NEW YORK, NY – David Bressler, the Republican/ Conservative/ Reform Party candidate for the New York State Assembly in the Northern Queens 26th A.D. in this coming November’s election, told me during an interview I conducted with him last week, that while he promises to never mount a personal attack on his opponent, 4-term Democratic incumbent Edward Braunstein, that promise does not apply to Braunstein, the Assemblyman and member of the Democratic Party. “I have met Assemblyman Ed Braunstein on several occasions and have found him to be pleasant and respectful… I have nothing but good wishes for Ed Braunstein, the man; those same good wishes, though, do not extend to Ed Braunstein, the Assemblyman, because he belongs to and has voted consistently along with the new configuration of the Democratic Party that is pursuing extremist, leftist, progressive policies that are disastrous for the state in general and the 26th A.D. in particular,” Bressler stated. 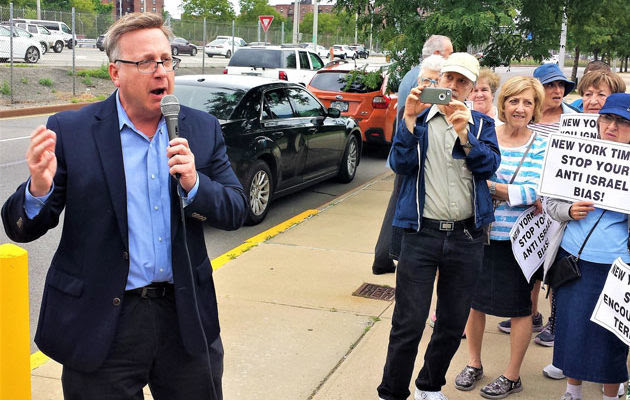 Republican, Conservative, Reform Party Candidate David L. Bressler speaking at Pro-Israel rally, Photo credit: Bressler campaign. Bressler, sixty, whose resume includes running his own small business, working as a director in private industry and serving as a president and treasurer of the Bay Terrace’s Bay Club, a large apartment complex where he has lived the past ten years, offered three specific examples of what he contends to be left-wing Democratic policies that he ties to Braunstein because he is a member of that party. The first concerns the highly contentious Assembly bill, A10427. Sponsored by Brooklyn Assemblyman Charles Barron this past May, the bill, if it becomes law, would do away with the Specialized High School Achievement Test (SHSAT), a long standing highly competitive knowledge – based entrance exam administered to graduating middle school students seeking admission into the eight specialized NYC High Schools, which include Stuyvesant, Brooklyn Technical and the Bronx High School of Science. Under the bill, which was designed to increase the rate of black and Latino student enrollment in these specialized high schools from its current 9% to 45% within the next three years, grade point average (GPA) would primarily replace the SHSAT as the criteria for admission into these schools. 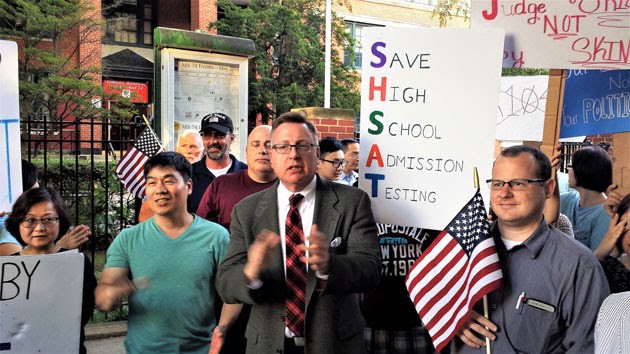 Republican, Conservative, Reform Party Candidate David L. Bressler speaking at SHSAT rally, Photo credit:Bressler campaign. Bressler added that among the murderers on parole that Cuomo granted the right to vote is Herman Bell, a recently freed 1971 three-time convicted cop killer. “On May 21, 1971, Herman Bell murdered New York Police Officers Joseph Piagentini and Waverly Jones, and on August 29, four months later, while still on the loose, this monster participated in the murder of San Francisco Police Sergeant John Young…. For these horrific crimes, Bell should have spent his entire life rotting in prison. Instead, he was paroled this past spring by Cuomo and, beyond all comprehension, now has the right to vote”, stated Bressler. The GOP candidate also condemned the governor’s granting voting rights to rapists and pedophiles who will be allocated a two-hour time frame, 7pm – 9pm, to vote in school polling sites on election days. “Didn’t the governor realize that the very idea of sexual predators being allowed to enter schools would offend the sensibilities of New Yorkers? Worse still, didn’t the governor realize that allowing these fiends on school grounds from 7-9 pm would jeopardize the safety of the tens of thousands of students throughout the state who participate in after school programs during those hours?”, Bressler asked rhetorically. 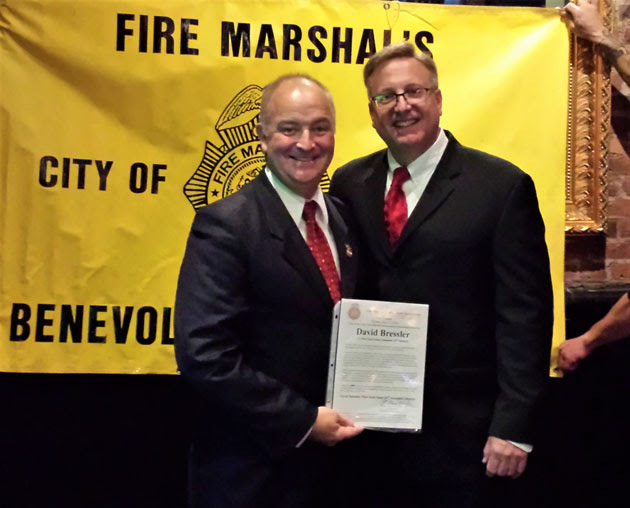 Republican, Conservative, Reform Party Candidate David L. Bressler endorsement by William Kregler, President of Fire Marshalls Benevolent Association, Photo credit: Bressler campaign. Lastly, Bressler tied Assemblyman Braunstein to Governor Cuomo’s and Mayor de Blasio’s controversial plan, announced last year, to, within the next ten years, close Rikers Island- a vast jail complex incarcerating approximately 9,000 inmates at a time, which for decades has been plagued by violent attacks committed by inmates on correction officers, civilian employees and other inmates- and transfer its entire population into a cluster of smaller prisons placed primarily in residential neighborhoods throughout the city’s five boroughs. Bressler asserted that, if implemented, the plan would endanger the safety and security of all New York City residents. Bressler might have a real chance of making good on that promise. While reliable polling data is not as of this writing available, the general consensus of my Queens Democratic and Republican sources is that the race in the 26th A.D. is a toss-up. These political pundits, I learned, view last year’s NYC mayoral election, where the Republican challenger, Nicole Malliotakis, bested Mayor de Blasio by an eye-catching 23% margin in the 26th A.D., as a positive omen for fellow Republican Bressler. However, most of these same pundits pointed to the 2.5 to 1 voter party registration advantage that Democrats hold over Republicans in the district as a daunting challenge for Bressler to overcome. 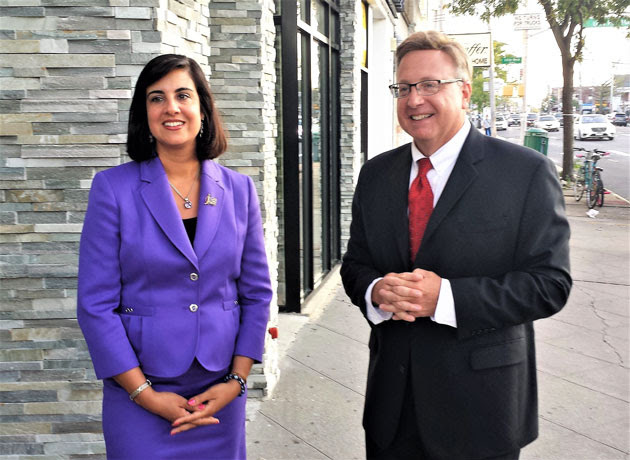 Republican, Conservative, Reform Party Candidate David L. Bressler with Assemblywoman Nicole Malliotakis, Photo credit: Bressler campaign. So it seems unlikely that there will be many educated bets made on whether David Bressler or Ed Braunstein turns out to be the winner on election night, November 6th, in the race for the assembly seat in the 26th A.D.